San Francisco really has no seasons. Summers are foggy, winters are foggy, spring and fall are foggy. Maybe add some wind and rain in the mix, but you can pretty much expect the same weather here year-round. Usually around September time, things tend to get a little warmer, but I'd still pack a jacket! 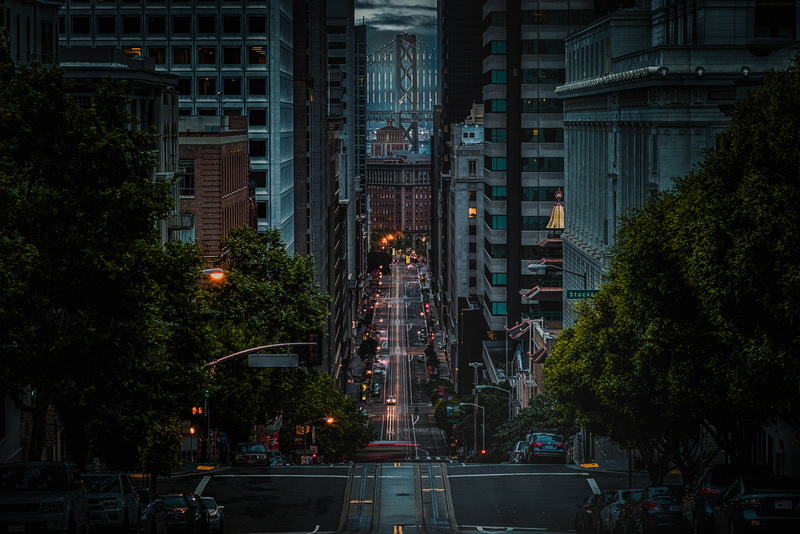 San Francisco is made up of various districts and each has its own unique culture and vibe. Because SF is so small, hotels in San Francisco are generally in districts next to each another. Hayes Valley - Very hip, energetic area. Loaded with a ton of great restaurants & bars. Also has an outdoor movie area right next to Smitten's Ice Cream (ice cream made with liquid nitrogen). Mission District - Also close to great restaurants & bars and Dolores Park. Ideally, you'd want to stay in Noe Valley and just walk to the mission. Sunset District - On the outskirts of the city, but home to many dive bars, San Tung (delicious chicken wings) and Golden Gate Park. Outer Richmond - Near the beach, great for surfers (with wetsuits) and close to Sutro Baths and Fort Miley. Pac Heights - Wealthy neighborhood with chill pub vibes in the Marina. Castro - LGBT friendly with great dive bars and food (I think it's safe to say every district has great food and bars). I'd stay away from the Tenderloin area...unless you don't mind people openly doing drugs in front of you and the police. As you might have heard, our public transportation (Muni and Bart) isn't the best, especially when comparing it to Hong Kong or Tokyo. But in this day and age in SF, Uber & Lyft are your best friends as they are faster, more convenient, and omnipresent. Since you're in the home of Uber & Lyft, why not use it! Cars are available everywhere and with Uber pool or Lyft line you could spilt the cost and meet new people with other riders heading in the same direction (only works for a party of 2). SF is a small city so the cost would never be outrageously high...with the exceptions of blitz or prime pricing, then I'd consider taking taxi or muni. Muni gets you around within the city and BART is designed to get you outside city limits (the Bay Area). Muni has a mix of light rail, streetcars, and busses and cost $2.25 for 90 minutes. If you are planning to take either, consider getting a Clipper card as it can be used for both systems. Cable cars fares are a bit different and require an additional purchase. You can find more information here. There are so many good restaurants in SF that it is hard to condense this list any smaller. I'd recommend just randomly picking any place on this list and try to make reservations (if applicable). Big Bus Tour - A great and easy way to see San Francisco's iconic landmarks without the worry or hassle of parking or taking public transportation. This also includes an Alcatraz package which can save you money. Pier 39 - Come see the seals, enjoy a carousel ride, and grab some delicious seafood. Coit Tower - A 360 view of San Francisco. Mission District - Enjoy some of the best Mexican food, beautiful murals, and a great night life. Golden Gate Park - A huge park that includes two museums, paddle boating, tandem biking, and many more. The Embarcadero - A place to enjoy a walk, eat, and has one of the best views of the bay bridge. Billy Goat Hill - A park that has a rope swing overlooking the city. Lombard Street - San Francisco's crooked street. Sutro Baths - A beautiful view of the ocean. Sutro Heights Park - A lesser known part of the city, Sutro Heights Park offers an incredible view of the city and the ocean. Palace of Fine Arts - Made for the 1915 World's Fair, these huge structures will leave you in amazement. Walt Disney Museum - A museum dedicated to Walt Disney's life and work with a rotating exhibit every season. Alcatraz - An iconic San Francisco landmark where it once housed the world's most dangerous criminals. Potrero Hills - A unique cityscape shot. Twin Peaks - One of the best cityscape views. Kirby Cove - A beach with a swing that is great for a sunrise Golden Gate Bridge shot.